This is an attempt to another upper branch of Pingjia Stream. 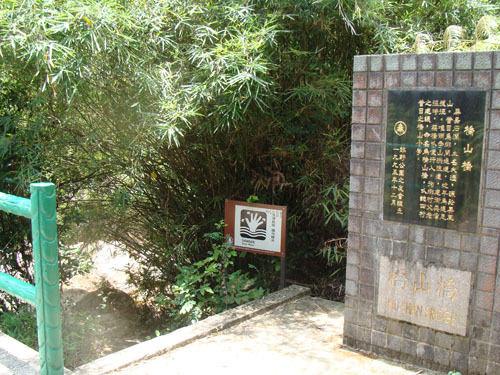 In early years, we have visit another uppper stream of Pingjia. 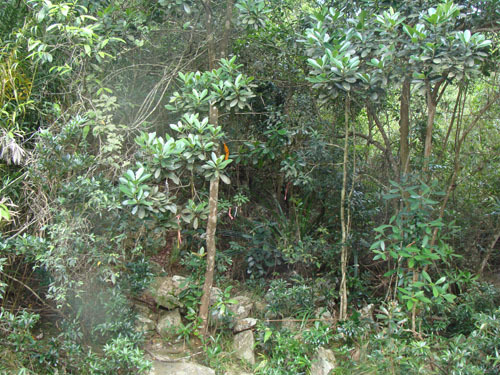 We started in the middle entrance and trek all the way up to Wong Leng along the stream. 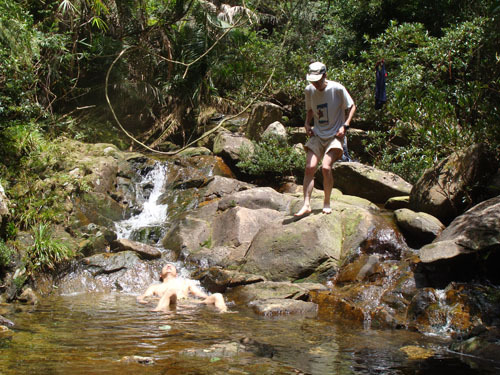 The upper stream holds many shallow clean water pools which are not too common for upper streams. 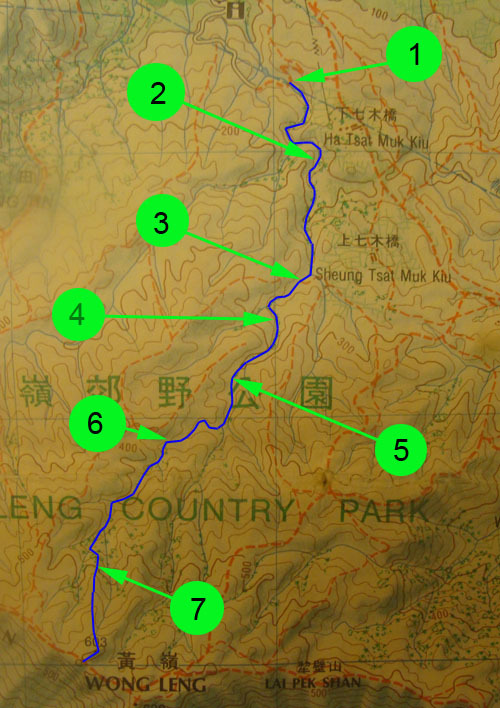 The upper stream of Pingjia is seldom visited by hikers, guilding ribbons are limited. There are many offshoots as well. You have to be an experienced stream trekker in order to stay on track. 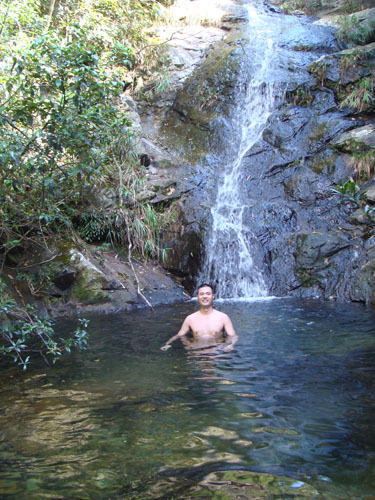 We entered the stream from Qiao Shan Qiao (橋山橋). 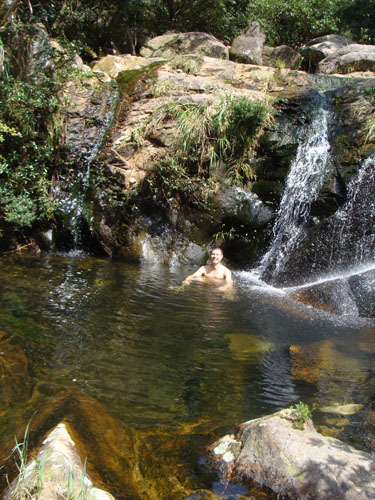 It was 30C, we needed to cool down in a fresh water pool. It was the mid exit, you can opt to leave the stream here. You can leave either on left or right, if you give it a pass, your next exit is Wong Leng mountain ridge. In the past, there was no guilding ribbons tied for the mid exit. One can easily miss it. Now, the mid exit is highlighted by numerous ribbons. Time to cool down again. Most of pools in this stream are shallow. Only good for cooling, not swimming. At 330M, there is an junction, we took the right branch. Cooling pools showed up again. After bathing, you can take the slope on your right to continue the journey. After 400M, the stream really narrows up. Trekking is getting more difficult. 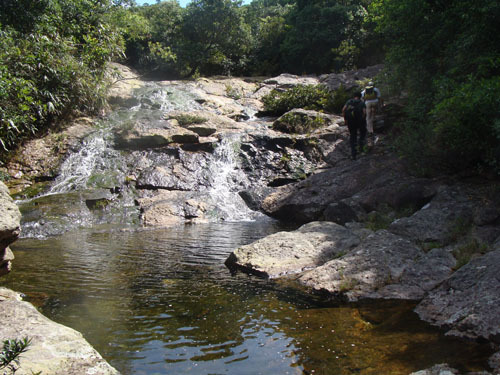 At around 455M, the thin stream buries itself in very dense vegetation, there is no way to follow the water track anymore. You need to look for a very old red ribbon tied on the right. This should be the second last ribbon you can find on this trip. This ribbon hints you the direction of the exit. The portion from the last two ribbons to the open area is raher confusing and bushy. However discouraging, just keep going. Finally we emerged from the upper stream forrest and reached open area. 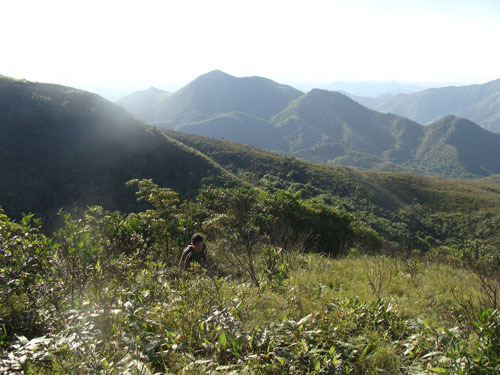 Just trek along the ridge amid all those short bush, you will get to the main hiking trail on Wong Leng.